AFRICAN AMERICAN REPORTS: Did Blake Griffin intentionally throw water on fan. 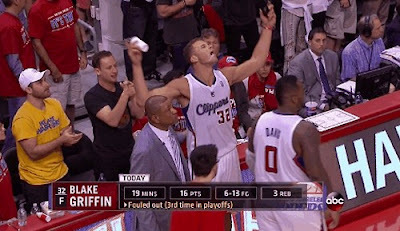 Did Blake Griffin intentionally throw water on fan. During a NBA playoff game against the Golden State Warriors Blake Griffin seemed to accidentally pour water on a visiting Golden State fan while looking at a video replay. When I first saw it I thought it was an innocent mistake. But the more I saw the replay the more I think that Griffin did that sh*t on purpose, LOL. Of course Blake says he didn't do it on purpose. I say what are the odds that he accidentally hits the Golden State Warrior fan sitting up front? Check out the video and let me know what you think. George Cook AAReports.com. Did Griffin dump water on the fan on purpose?